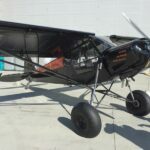 The Super Cub is one of the most popular aircraft in all of Alaska and is well suited for the variety of conditions and rugged terrain encountered in rural and remote areas of the State. 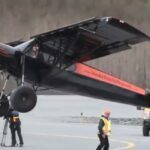 The plane is known for its incredible short take-off and landing capabilities, and is the star of the Valdez Fly-in, held in May. For Arctic Thunder 2016, we are privileged to have Mr. Bob Breeden and Mr. Hank Swan. Bob Breeden is the record holder, landing his Super Cub in a world record 20 feet, and a take-off distance of 24 feet. 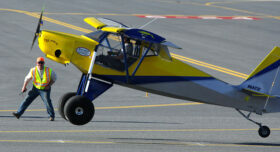 Hank flies an experimental hot rod Super Cub called “Got Rocks” and is making his second appearance at Arctic Thunder. They will be joined by a 1941 L-1 aircraft and the L-13 for a joint civilian and military short field take-off and landing.